Dominique comes to The Nina five days a week to explore her favourite media, collage and painting. Many of her works show brightly coloured scenes of summer, her favourite season, and images from nature such as flowers and trees. Dominique’s love of nighttime city lights inspired her to create her favourite piece, a collage of magazine images of downtown buildings lit up at night. 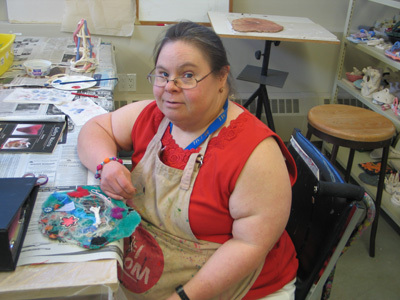 During pottery, she builds pieces and other things that interest her like fanciful shoes out of the past. For the last few years, Dominique has been working on meticulously beading objects. She loves the feelings of happiness and pride she gets when she finishes a work of art. Dominique lives with her mother in Edmonton, and previously lived in Bonnyville for five years. Aside from art, her interests include swimming, macramé, and watching Days of Our Lives. She also enjoys bowling at Bonnie Doon and going to the Valley Zoo, where her favourite animals are the bears and zebras.